The benchmark heavily favors 4k random reads / writes. This is because for application and operating system performance this is by far the most important metric. Traditional benchmarking methods like dd write, hdparm read tests, etc. are very poor indicators of everyday performance. What matters is not how fast your storage can push through giant files but how fast it can respond to random input that asks it to read / write anywhere on the disk. To understand why we need to think of what your Raspberry Pi is usually doing. Most applications and services are not constantly writing giant sequential files which is what traditional synthetic benchmarks measure. Your Raspberry Pi is usually updating log files, reading data from different parts of the disk for various applications and services, responding to user input, etc. To your disk drive this behavior is considered “random” since it has no idea what it will be asked to read / write next. Storage devices doing large sequential I/O like transferring files utilize extensive caching and other techniques to speed up these kinds of operations. Unfortunately these techniques do not work when the operating system and storage device doesn’t know what users / applications / services might request next. The storage device has no way to know or prepare for what your application will want next so it has to read it raw from the disk and can’t rely on cache. This is why in our benchmarking we want to look very hard at 4k random read / writes. This is what will determine how “snappy” the Pi feels as you perform various tasks. Fast 4k random IO devices feel and perform much better than a device with huge throughput but poor random I/O performance. The best choice is a 2.5″ Solid State drive connected via USB. This is the highest performance choice and is very cheap (< $30). The benchmarks show that any solid state drive is so fast that it maxes out the Raspberry Pi’s USB 2.0 bus. I’ll talk about this more in the SSD analysis section below but basically it’s best to get the cheapest option while still picking a reliable brand. 99% of USB drives are horrible choices for Pi storage media because they have very poor 4k random read / write performance. 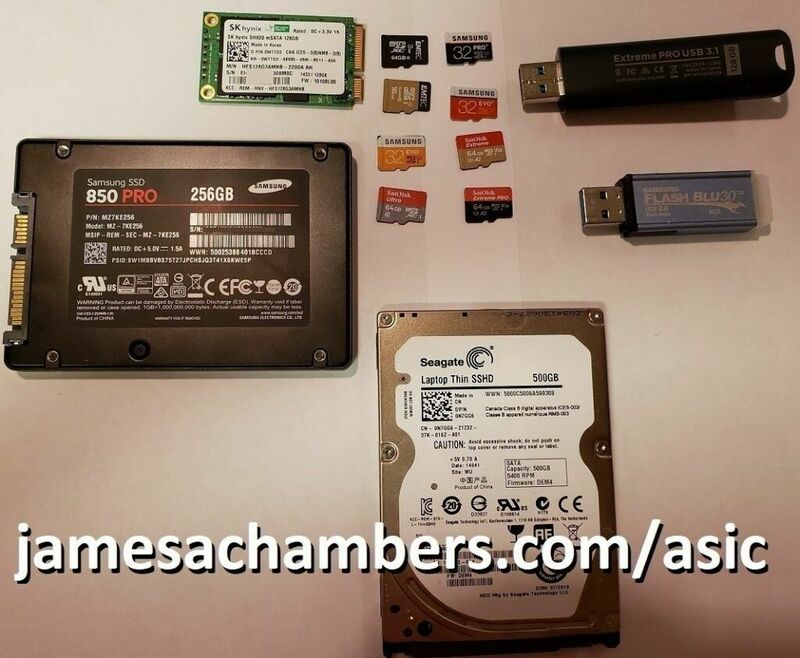 Micro SD cards are way faster than almost all of them. However, there is a special exception which in 2019 is much more reasonably priced. There is a special USB drive by SanDisk that is actually a solid state drive on a stick. It has the same size / dimensions of a regular flash drive but uses solid state storage internally giving it great 4k random read / write performance. I own it and it benchmarked at 2330 putting it more than double any MicroSD card and only a couple hundred points below Samsung Pro 2.5″ SSDs. There’s lots of cool projects out there that using any type of USB attached storage is not an option. For these projects Micro SD is still king. The good news is that Micro SD has had some recent developments such as the A1 / A2 application class cards. A2 is not supported by Raspberry Pi yet (or almost anything else really) so A1 is the important mark to hit. The SanDisk Extreme A1 is a good budget option. At time of writing it is only $10.94 for the 32GB version. If you need higher capacity than 32GB it is cheaper to go with the A2 Extreme Pro version of the card. I own this version of the card and it benchmarked at a very high 1039. It had the highest 4k random write speed of any card I own. SSD benchmarking so far has shown that there is not much of a difference between an older cheap SSD like a outdated mSATA Hynix drive and top of the line drives like the Samsung 850 Pro. The difference from the oldest cheap drives and top of the line was only about 100 points. This is because the Pi has a USB 2.0 bus. Even the slowest oldest SSDs are so fast that they hit the maximum possible data transfer rate over USB 2.0. Because of this it makes sense to buy the cheapest SSD drive possible that is still reliable. See my recommendations section for ideas. The Micro SD market has always been a difficult place for Raspberry Pi owners. Since there traditionally was no classification that indicated random read / write performance we simply had to buy different cards and benchmark them. The problem with that was that Micro SD manufacturing processes change. They can even change from batch to batch. The 2015 Samsung Evo cards were a good example of this. We found a card with amazing 4k random read / write performance but one day they changed their process and the new ones are not even close. Fortunately things have recently improved for us somewhat because of, well, smartphones! Let’s talk about the application class. Application class cards were created because smartphones have become one of the top use cases for SD cards. Many people run applications directly off their SD card or have applications that keep their active storage on there. 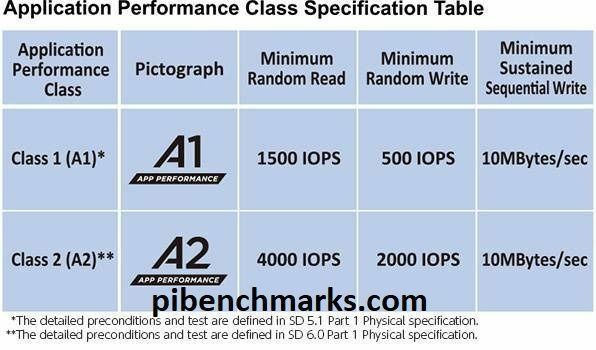 Tech savvy smartphone users sick of slow performing cards demanded a speed class was created to measure this type of performance. This is great for us Pi owners because this type of use is 4k random reads / writes and is exactly the same as what we do on the Pi. Thank you smartphone owners! It’s important to note that right now the Pi (and pretty much everything else) cannot currently make use of the new A2 standard as it requires special driver support to take advantage of the new features. I have benchmarked both the SanDisk Extreme and the SanDisk Extreme Pro A2 cards in my benchmark results and they did not perform any better than the A1 cards because of this. The new A1 application cards are fantastic and performing very well on the benchmark. So far every application card benchmarked has hit the minimum A1 targets. If you are looking for a better performing SD card then A1 is the way to go. These don’t matter for the Pi. Basically at all. They are measurements for maximum sequential I/O throughput. For example if you have a video camera that needs to record in 4k it will need a very high sequential I/O maximum transfer rate. The Pi depends on 4k block size random I/O as I’ve explained in earlier sections and these classifications don’t measure that. Indeed, my 3 worst performers on the benchmark are all U1 cards and got easily stomped (nearly doubled in score) by a SanDisk Ultra Class 10. This doesn’t mean U capable cards are bad. The Samsung Pro+ is a U1 class card and performed incredibly well on the benchmark. It just means that the Samsung Pro+ has much higher quality memory / a better controller inside it. The conclusion is that unlike the application class these classifications will not tell you if your card is going to be good or awful for the Pi. You need to benchmark them to know! You may have noticed that my top performing Micro SD card for this year was the 2015 Samsung Evo model. Again. Although the DD Write output throughput is a little lower than some of brand new cards it more than made up for it on the 4k random read / write performance. This card’s random 4k read performance is so fast it actually beat several solid state drives. Only the Samsung Pro+ came close on read speed but got beat by a whopping 300 IOPS on the 4k random write letting it come out on top again. The problem seems to be one of those “they don’t make them like this anymore” things. I bought the Samsung Evo+ (it should be better right?) and it occupies one of the worst performing cards in my arsenal all the way down with the EMTEC dollar store cards. Other people have noticed this discrepancy too. At some point Samsung must have changed their manufacturing process and started using a different type of memory or on-board storage controller (likely to a cheaper one) for these cards. This is a big reason why I created this benchmark. With a bigger sample size of cards we as a community can pool our card benchmarks together and figure out which manufacturers and lines of cards are getting the good memory / on-board storage controllers. Manufacturers change their processes all the time (even from batch to batch) so to keep up we will need to watch the benchmark results and see where the “good stuff” is going and when the card quality quietly changes! The only sensible Micro SD cards to buy right now are application class (A1 or higher). With the new benchmark we should be able to learn a lot more about storage on the Pi. Micro SD cards seem to be the area we need to learn the most about. As more people run the benchmark we’ll continue to analyze and revise recommendations based on what everyone finds!